These handouts are for all AIC members – They were produced for the CIPP workshop 2015 held at the AIC meeting in Miami, Florida. 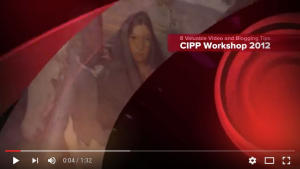 Here is the quick intro video I made for the 2012 CIPP workshop. Thanks so much for the handouts. i was not able to get to your talk and this is going to be very useful for my department. There are many in the museum that do a lot of this social media stuff and the Preservation Office is just now trying to get our material up there without enough time to really spend the type of research you have done. Thanks so much for sharing. Thanks Joanna. You were missed. There’s talk of an encore performance, so we’ll see. I’d like to see if people put into practice this set of handouts. I look forward to seeing your video Alex. Thanks for the comments. Great workshop and lots of valuable information. I am afraid that I am a Luddite when it comes to social media and networking, but you made a number of great points that even a Luddite can use. I am looking forward to putting some of them in motion. I am still trying to digest the number of social media systems that you make such extensive use of, and I really don’t know how you can keep up with it all. I missed the Tyler Green keynote, so thank you for sending along his good points as well. I’ll put together an Animoto video when I get back to my studio, or at least after I catch up with my current deadlines, and will send it along for your entertainment. Thanks so much for making all this available. Your workshop was obviously a fantastic success, I am so sorry I couldn’t be there because of another workshop that at this time I also needed. Conflict of schedule. Thank you so much for the handouts and other info that will teach us. Scott, thanks very much for all of this! Thanks for posting these! I will love to read them. This is way beyond cool! Congrats!! Thanks for the comment. Yes, I’ll leave this page up. Happy trails. I know what you mean by a heavy travel schedule. If all my efforts fall into place, I’ll be on the road 275 days between now and Oct. I leave tomorrow for some consulting work in Italy (and, yes, to have a good time, so don’t cry for me). BTW, these simple techniques shown in the handouts can be done on the road if you are hooked up with the internet. All you need is your digital camera. Thank you so much for doing this and providing this information. I have been traveling for work so much this year that I just could not attend AIC. I think this workshop must have been wonderful. I hope you leave this up for awhile as I am on the road again tomorrow and won’t have time to look it this for a few weeks.